In his undergraduate days, Winship Cancer Institute dermatologist and cancer researcher Jack Arbiser was an organic chemist. That may be why he recognized an organic synthesis reagent based on the metal palladium as a potential anti-cancer drug. We’re talking about Tris-DBA-palladium. Arbiser and colleagues showed in a 2008 Clinical Cancer Research paper that this deep purple stuff (see photo) is active against melanoma, and since then, against other types of cancer such as pancreatic cancer, multiple myeloma, and CLL leukemia. Tris-DBA-PD has a deep purple color. The palladium atoms can be seen in the diagram as two blue balls at the center. 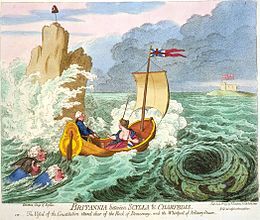 From Wikipedia. Since it’s used in organic synthesis, you might expect Tris-DBA-palladium not to be very soluble in water. A new paper in Scientific Reports demonstrates that this issue can be addressed by hooking up the reagent to nanoparticles made of hyaluronic acid, which targets tumor cells. They are effective against melanoma in mice, the paper shows. In an email to Lab Land, Arbiser says he arrived at Tris-DBA-palladium by using his chemist’s imagination, in a “your chocolate landed in my peanut butter” kind of way. 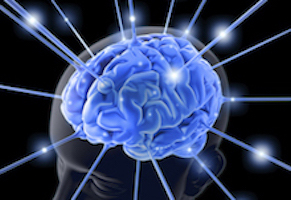 Cells’ metabolic needs are not uniform across the brain, researchers have learned. “Knocking out” an enzyme that regulates mitochondria, cells’ miniature power plants, specifically blocks the development of the mouse cerebellum more than the rest of the brain. The results were published in Science Advances. 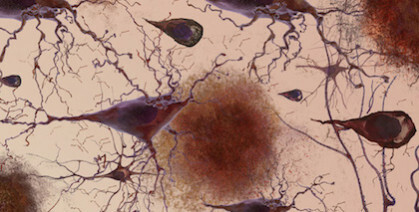 “This finding will be tremendously helpful in understanding the molecular mechanisms underlying developmental disorders, degenerative diseases, and even cancer in the cerebellum,” says lead author Cheng-Kui Qu, MD, PhD, professor of pediatrics at Emory University School of Medicine, Winship Cancer Institute and Aflac Cancer and Blood Disorders Center, Children’s Healthcare of Atlanta. The cerebellum or “little brain” was long thought to be involved mainly in balance and complex motor functions. More recent research suggests it is important for decision making and emotions. In humans, the cerebellum grows more than the rest of the brain in the first year of life and its development is not complete until around 8 years of age. The most common malignant brain tumor in children, medulloblastoma, arises in the cerebellum. Qu and his colleagues have been studying an enzyme, PTPMT1, which controls the influx of pyruvate – a source of energy derived from carbohydrates – into mitochondria. 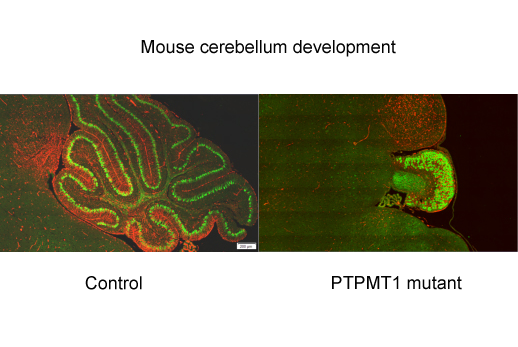 They describe pyruvate as “the master fuel” for postnatal cerebellar development. Cells can get energy by breaking down sugar efficiently, through mitochondria, or more wastefully in a process called glycolysis. Deleting PTPMT1 provides insight into which cells are more sensitive to problems with mitochondrial metabolism. A variety of mitochondrial diseases affect different parts of the body, but the brain is especially greedy for sugar; it never really shuts off metabolically. When someone is at rest, the brain uses a quarter of the body’s blood sugar, despite taking up just 2 percent of body weight in an adult. More here. Also, see this 2017 item from Stanford on the cerebellum (Nature paper). Despite being studied for decades, the chemotherapy drug cisplatin is revealing new aspects of how it works. 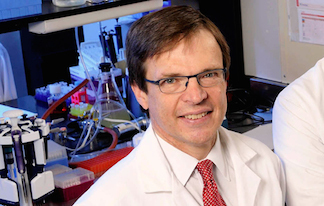 Researchers at Winship Cancer Institute of Emory University have identified an enzyme responsible for making tumors and cancer cell lines resistant to cisplatin, along with an experimental drug that targets that enzyme. The results were published on July 19 in Cancer Cell. Cisplatin is a DNA-damaging agent used in standard treatment for lung, head and neck, ovarian, and testicular cancers. It has a simple structure, grabbing DNA with its metallic (platinum) arms to form crosslinks. It used to be known as “cis-flatten” because of its nausea-inducing side effects. The experimental drug, lestaurtinib, has already been tested in clinical studies in combination with other chemotherapy drugs, which means it could easily go into trials against tumors displaying cisplatin resistance. 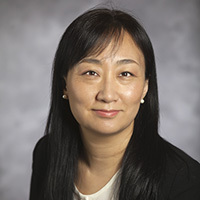 Sumin Kang, PhD, and colleagues at Winship decided to look for enzymes whose activity was necessary for cancer cells to withstand cisplatin treatment. They chose kinases, enzymes that often control some aspect of cell growth and are have plenty of existing drugs targeting them. The researchers found that in combination with a sub-lethal amount of cisplatin, “knocking down” the activity of the kinase MAST1 kills a cell. But how does that combination work? Cancer cells are well known for liking the simple sugar glucose. Their elevated appetite for glucose is part of the Warburg effect, a metabolic distortion that has them sprinting all the time (glycolysis) despite the presence of oxygen. A collaboration between researchers at Winship Cancer Institute, Georgia State and University of Mississippi has identified a potential drug that uses cancer cells’ metabolic preferences against them: it encourages the cells to consume so much glucose it makes them sick. Winship Cancer Institute postdoc Kishore Kumar Jella has been invited to speak at the NATO advanced research workshop “BRITE (Biomarkers of Radiation In the Environment): Robust tools for Risk Assessment” in Yerevan, Armenia, on 28-30 November, 2017. The workshop brings together leading international experts to evaluate currently and developing radiation biomarkers for environmental applications. Jella works in the Departments of Biochemistry and Radiation Oncology under the direction of Professors William S. Dynan and Mohammad K. Khan. 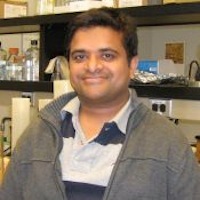 He will speak on “Exosomes as Radiation Biomarkers”. He will describe how radiation influences exosome production and how these exosomes influence the immune system. The work has applications both to radiation carcinogenesis and combination radio-immunotherapy. Jella is supported in part by a grant from the National Aeronautics and Space Administration to Dynan. Exosomes are nano-sized membrane-clothed capsules containing proteins and RNA that are thought to facilitate cell-cell communcation. They were previously implicated in the ability of cancer cells to influence healthy neighbor cells, and have also been proposed as anti-cancer therapeutic vehicles. Jella’s previous research on exosomes and radiation-induced bystander signaling was published in Radiation Research in 2014. Guest post from Megan McCall at Winship Cancer Institute. It is not very often that a high school student has the opportunity to work in a lab or clinic shadowing a world-renowned doctor, but for the past six weeks, ten Georgia high schoolers have done just that at Winship Cancer Institute. Summer scholars in Medical Simulation Lab. Photo by Megan McCall. The Summer Scholars Research Program, now in its 16th year, exposes students to a multitude of experiences, such as research from Winship’s top experts, lectures by doctors from a variety of specialties, and field trips to Grady Memorial Hospital and the Centers for Disease Control and Prevention. 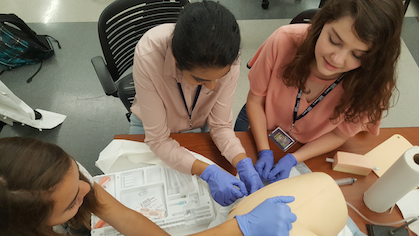 The students have also seen different parts of Emory’s campus through visits to the School of Medicine’s Medical Simulation Lab and the Health Sciences Research Library. The SSRP pairs each student with an oncologist with whom they complete their own research project and get an in-depth look at a specific cancer specialty. The program will culminate on Friday (8:30 am to 12:30 pm, C5012) with the students presenting their projects to an audience of their peers, mentors, and the Winship community. When cancer cells split off from a tumor to seed deadly metastases, they are thought to travel as clusters or packs, a phenomenon known as collective invasion. The members of an invasive pack are not all alike, scientists at Winship Cancer Institute of Emory University have learned. Lung cancer cells making up an invasive pack have specialized roles as leaders and followers, which depend on each other for mobility and survival, the scientists report in Nature Communications. The differences between leaders and followers — and their interdependence — could be keys for future treatments aimed at impairing or preventing cancer metastasis, says senior author Adam Marcus, PhD, associate professor of hematology and medical oncology at Winship Cancer Institute and Emory University School of Medicine. Marcus and former graduate student Jessica Konen, PhD began by observing how a mass of lung cancer cells behaves when embedded in a 3-D protein gel. The cells generally stick together, but occasionally, a few cells extend out of the mass like tentacles, with the leader cell at the tip. In lung cancer patients who were taking immunotherapy drugs, testing for revived immune cells in their blood partially predicted whether their tumors would shrink. The results were published online by PNAS on April 26. This finding comes from a small study of 29 patients, who were being treated at Winship Cancer Institute of Emory University with drugs blocking the PD-1 pathway, also known as checkpoint inhibitors. The study supports a straightforward idea: if tumor-specific CD8 T cells appear to respond to the drug (nivolumab, pembrolizumab or atezolizumab), that’s a good sign. This avenue of investigation may also help researchers figure out why some patients do not benefit from checkpoint inhibitor drugs, and how to combine those drugs with other treatments to increase response rates. While looking for activated immune cells in the blood is not yet predictive enough for routine clinical use, such tests could provide timely information. Monitoring the immune response could potentially help oncologists and patients decide, within just a few weeks of starting immunotherapy drugs, whether to continue with the treatment or combine it with something else, says co-senior author Suresh Ramalingam, MD, Winship’s deputy director.